Many middle school-age children don’t want their parents dropping them off right in front of the school. Because they want to seem independent and separate from their parents, kids around middle school age often don’t want their peers seeing them getting a kiss or hug from their parents. But when middle school student Audrey from California did not get dropped off down the block from school one day, she was angry at her mom – but not because she hated being seen with her. Audrey wanted to meet a strange man before school. It was a guy who had been talking to her for some time now. Her mom wanted to know why her daughter was so angry about it. 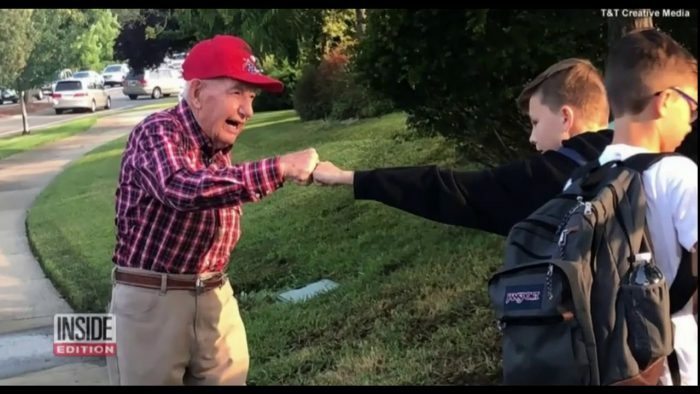 The middle schooler said that she loved talking to the “cute little old man” before classes started. That was enough to terrify Audrey’s mother. Who was the strange man approaching her daughter before school? What were his intentions? She decided to do some digging. She drove over to where the man was hiding and immediately her heart burst. The man was not trying to cause any harm to her daughter. He was a harmless, and kindhearted 94-year-old United States Navy veteran. The veteran’s name is Wally Richardson. He served in the Navy, but the students at Marina Village Middle School know him as “Mr. Knuckles.” And the decorated veteran is okay with the foolish name. Wally loves children. They remind him why he served in the military in the first place. He loves seeing how full of life they are and how they have dreams and aspirations. So he gets up early so he can spend a few minutes with the inspiring children before they start school. But first, he eats a hearty breakfast and does some movement exercises – things he learned to do every day while in the Navy. With his routine finished, he goes over to the middle school so he can greet the children in the morning. He gives the children handshakes and a big smile. He also offers advice and wisdom to the young souls. The children then go into class with a boost of energy from the Navy veteran. And he gets to go back home and enjoy the rest of his day knowing that he did something good first thing in the morning. It’s a win-win situation for all parties involved. This routine is nothing new for the 94-year-old veteran. Wally has welcomed the students at the middle school almost every day for the last ten years. He’s a regular person there in the mornings. And he helps the children prepare for learning without expecting anything in return. Students all seem to agree: the morning routine with Wally is a highlight of their day. Because they get to meet an honorable Navy veteran and hear his stories about life, they learn so much. And in the video below, you’ll get to see Wally in action and discover more about why he has such a positive impact on the children at the middle school. What do you think about the service this veteran offers the children? 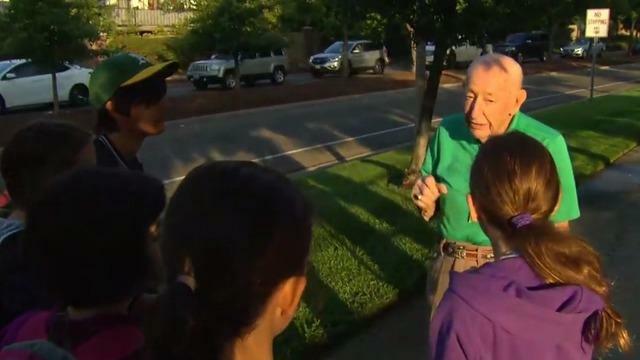 Do you think they’re learning a lot from the 94-year-old?